17 members and 6 guests turned out for our Annual Auction at which Tony Howgrave-Graham was again the Auctioneer. There were a total of 333 lots with something for everyone’s interests. The first 92 lots were mainly of aviation literature and despite many valuable items they were offered unreserved. The buyers’ took advantage and picked up some excellent bargains. The remainder were general lots. Not all lots were sold, however initial figures show that £1,170.29 (up on last year) was raised, an excellent result. 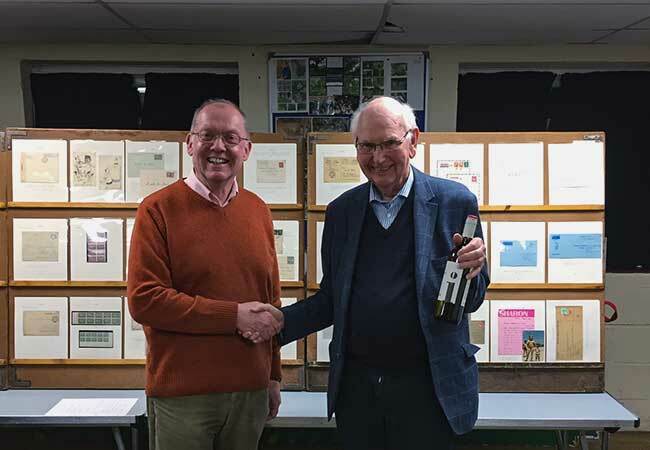 In closing the Chairman thanked everyone for attending, those who assisted in the running of the auction and especially Tony H-G for the considerable effort he put in to his last Auction as auctioneer to make it such a success. This year’s Day Meeting was again held at the Grasmere Hotel with a very encouraging attendance of 26 philatelists. An excellent day with very high quality material shown with something for everyone. The presentations were lively and interesting with a good atmosphere throughout the day with plenty of laughter. A boot in someone’s porridge comes to mind!!! The Convenor - Tony Howgarth-Graham - again did a brilliant job. The 5 minute bell was only used once – no names no pack drill! In closing Tony H-G thanked everyone for attending and Tony was thanked by everyone in return for organising another excellent day. The Chairman started the evening with the sad announcement that David Ashby a recent ex-member of the society died on Wednesday 6 March 2019. The society has sent a message of condolence to his relatives. The Chairman welcomed a guest Pete Kersley, who we hope will become a member. The material displayed was very good, however, it was disappointing that more members didn’t compete and this issue will be discussed at the next committee meeting. A very good turn out of 17 members with 2 guests. A warm welcome to Julian Frost our latest member. The first half of the evening we were treated to an excellent display by Jeremy of Military mail covering over 200 years from 1786. Starting with a cover from Worley Camp that was set up in 1786 in case the French invaded! Jeremy continued with material of French POW’s in Dartmoor, The Light Brigade, The Siege of Paris with post being flown out in manned balloons and campaigns in Egypt and India. He then went on to cover WW1 and WW11 with propaganda cards which showed people’s expectations and the reality, beautiful silk cards, invasion of Iraq (KUT) British POW in Turkey, the Arab revolt against British Rule. A friend of Jeremy’s flew 3 missions in WW11 dropping leaflets, one of which he displayed. A comprehensive section on Mesopotamia. WW11 Finland’s Winter War Malta with the important part that morale had to play throughout the war – troops were given Green X labels that they put in their envelopes to home that the recipient would affix to their reply envelope to indicate priority. Falklands War, the part the QE2 played, Libya censored marks and finally Iraq. Guest speaker - John Shaw - SA!? Salisbury Collectors Fair in Salisbury 17th & 18th May. 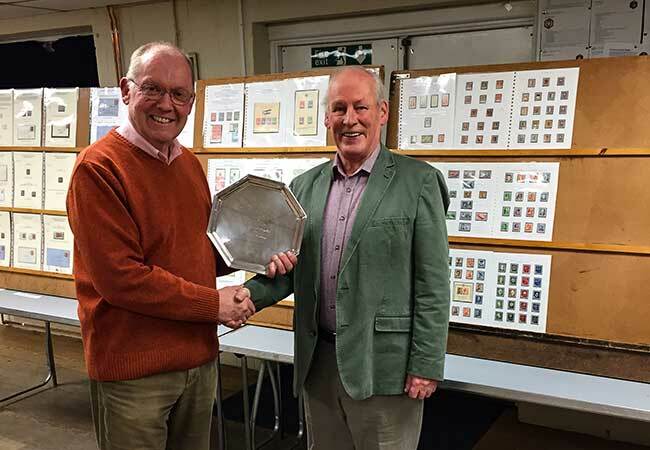 Next meeting Jeremy Martin – Military Mail from 1786 – 2nd half members’ displays and members’ bourse. 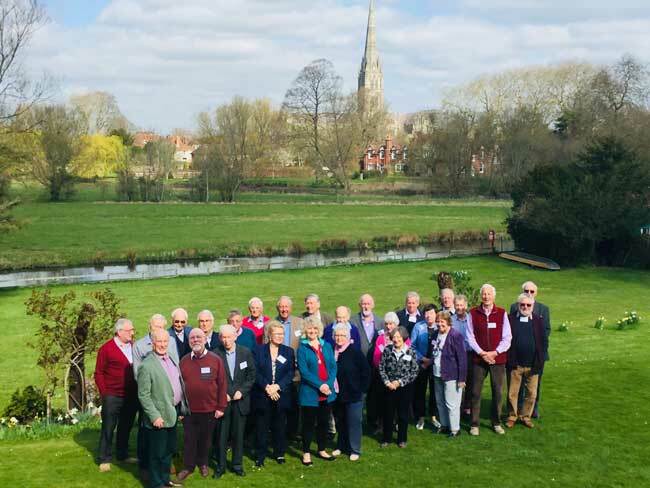 The next meeting on 20th February is the final chance for anyone wishing to put items into the Auction to hand them in to the Auctioneer, Tony H-G.
David Winnie (Chairman of the Channel Islands Specialists’ Society) extended an invite to all members to the CISS meeting which will be held at the Grasemere Hotel, Salisbury 26 – 28 April 2019. Jeremy Martin gave an update on Alan Wood’s health saying that he had been discharged from hospital last week and was now back home. John Shaw’s SA!? was not South Africa as many thought it would be but South America (Paraguay) and Haiti. In the first half John covered most compressively the stamps and forgeries of Paraguay. It would appear that all issued stamps of the country were at some time forged. In some cases the forgeries made their way into continental catalogues. The forgeries still have success at auctions as John has found out over the years to his cost!. The first stamps had a Lion (the national emblem) as the centre, Strange that a country that has no lions should use it as its national emblem? Some of the forgeries had some sad faced lions, one also had a fine moustache whilst another had disjointed knees. The Lion theme continued off and on although latterly the Presidents’ head was used for the centre. We were treated to proof essays, die proofs, plate proofs and colour trials. The country’s finances were not the soundest and when they ran out of stamps (regularly) and had no money to order more they used telegraph stamps surcharged, with John showing every known example. Amongst the postal history John showed a unique cover addressed to Uruguay. Should you think of collecting Paraguay you would be advised to seek the guidance of a specialist – such as John or our own Trevor Buckell – to avoid the inevitable forgeries you will come across! The viewing took some time as members discussed the marvellous display with John. After a short break we were treated to another exceptional display, this time the stamps and postal history of Haiti. The first stamps issued in 1881 were of 6 values imperf in a set plate of 50 of which John had a sheet. Again with this country most of the issued stamps were ripe for the forgers of which many were shown. Of the perforated issues there were a variety of errors – including imperf between. The subject of some issues were ‘strange’ anniversaries and the ‘strange’ name of the Presidents. In a few cases the stamps were designed and produced but at the last moment the President was deposed so that issue was destroyed. In one case we were shown what is believed to be the only surviving stamp from such a case. The 1939 3 stamp issue was the first to have a charity surcharge which was not popular or bought! John showed an anti-malaria issue which had the wrong species of mosquito shown and named; this was because it was produced by an American company who depicted the species found in America which was not the Haiti species. Overall a brilliant evening with many humorous anecdotes and an encyclopaedic amount of information which John delivered so well. 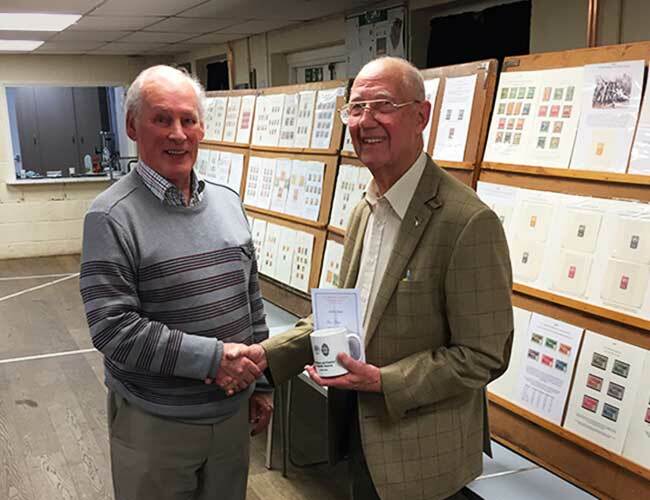 Wednesday 20th February 2019 First half Jeremy Martin - Military mail from 1786 – second half members' displays & members' bourse. Tony Howgrave-Graham - French Colonies and second half of Members displays. 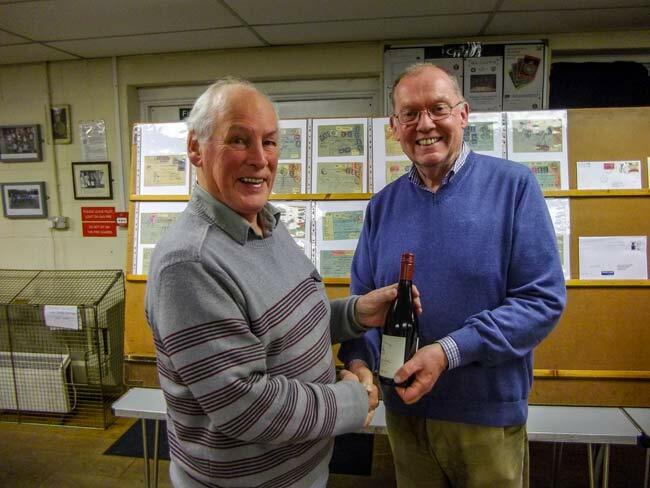 Tony Howgrave-Graham looking pleased with a bottle of red. We started our first evening of the New Year welcoming two potential new Members. Both John and Julian seemed to enjoy their first evening with us. As Alan Wood is still in hospital, we were very fortunate that Tony Howgrave-Graham stepped in at short notice to give us an outstanding display of French Colonies. A display worthy of Gold medal status. As the format for the first meeting of our New Year is half guest speaker and half Members, we offered Tony either half a certificate or half a mug or a full bottle of red wine. No prizes for guessing what he went for! Two Members displayed with Jeremy Martin showing pre-stamp material from Belgium. Paul Latham-Warde followed with Alsace-Lorraine Parcel Cards. Wednesday 6th February 2019 with John Shaw displaying SA(! ).